The Arroyo Colorado Conservancy (ACC) is hosting the Save the Arroyo Fiesta Oct. 10 at Dargel Boats in Donna, Texas, to celebrate 14 years of local conservation and watershed protection, said Arroyo Colorado Watershed Coordinator and ACC Executive Director Jaime Flores. “Since 1998, when dedicated stakeholders began meeting to come up with ways to address the various issues facing the Arroyo Colorado in Weslaco, we have been working to improve the water quality and to preserve, expand and enhance native wildlife habitat along the Arroyo Colorado for the benefit of current and future generations,” Flores said. Dargel Boats has partnered with the ACC to hold a boat raffle as part of the Fiesta, he said. 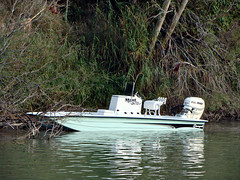 The raffle prize is a Dargel 190 Skout w/115HP Evinrude Motor & McClain Trailer, valued at more than $35,000. Flores said tickets are $100 each, and only 500 will be printed. For more information on sponsorship opportunities for the event, purchasing raffle tickets and the ACC’s work, visit ArroyoColorado.org or contact Flores at 956.495.5532 or jjflores@ag.tamu.edu.